Three new products that upgrade Commodore computers have been introduced from England by Small Systems Engineering, Inc. of Mountain View, California. Called the SoftBox, HardBox, and Petspeed compiler, these enhancements bring the benefits of the widely used CP/M operating system, Winchester hard disk mass storage, multi-user capability, and high-speed BASIC compiling to all PET and CBM microcomputers. The SoftBox permits Commodore users to run the hundreds of CP/M compatible applications packages, as well as interface with up to four Corvus Winchester hard disk drives. RS232 interfacing capability is also included. The HardBox, teamed one to a computer, will allow up to 64 users to access simultaneously the same Corvus hard disk storage – up to 80 Mbytes using the Corvus Constellation multiplexer. The Petspeed compiler allows Commodore BASIC programs to run up to 30 times their normal interpretive speed. The software includes optimization procedures that permit faster execution than other compilers. 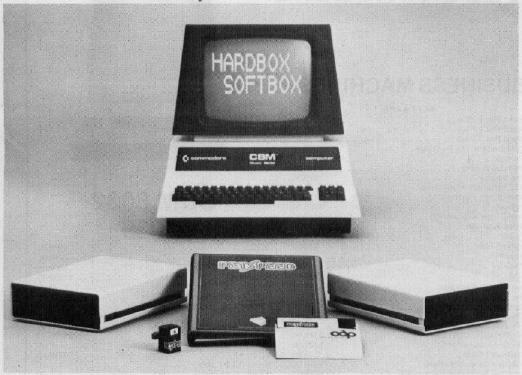 The SoftBox, containing a Z80-based 64K RAM board, modifies the CP/M operating system for the Commodore disk drive, using the PET or CBM computer itself as a terminal. CP/M version 2.2 software is included, and runs at 4MHz with no wait states, for rapid execution. A proprietary SoftBox system utility called NEWSYS gives users much latitude in reconfiguring the operating system for their own requirements. Menudriven options include disk drive, I/O, and RS232 assignment, as well as allowing the computer to emulate a Lear Siegler ADM3A, Televideo 912, or Hazeltine 1500 terminal. Small System's HardBox device enhances the PET disk operating system (PET DOS versions 1 or 2), allowing one to four Corvus drives to emulate the Commodore floppy disk unit for up to 64 users. Seven HardBox utilities are also included: user reconfiguration, password security, file transfer between hard disk and floppies, diagnostics, and use of a video cassette as a backup device. The Petspeed compiler uses a four-pass algorithm that gives priority to frequently used variables, removes unnecessary code, and utilizes integer arithmetic wherever possible. In addition to its fast execution, the compiler is available with unrestricted use. Software writers may sell their compiled programs without incurring additional royalties. The SoftBox and HardBox systems are respectively priced at $895 and $695. The Petspeed compiler lists for $350.